​Amazing, at the age of nearly 68, for hormones to miraculously start being produced! Powerful testimony to being completely healed from Migraines, Irritable Bowel Syndrome (IBS), Haemorrhoids, Lichen Sclerosis, Under-Active Thyroid, Stomach Bloating, Acid Reflux and more, through fasting, breaking generational curses and much deliverance, Praise God. 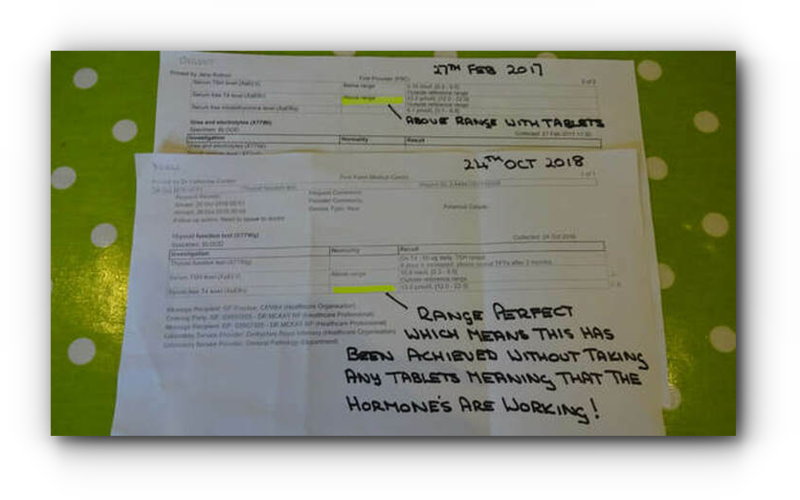 Right, is a photo of all the tablets that she used to take, before being healed, and she hasn't taken any now for over four months! This lady had been left paralysed in her arm from an overdose of radiotherapy from cancer treatment 10 years previous.. After prayer she began to feel pins and needles and started to regain her movement.. How awesome is our God.. Agape Fellowship, SW France. Below, is another healing testimony from ministering at the FGB YMCA Chapter, KL. This lady had been suffering with pulsating tingling pains in her face for about 2 months and God healed her instantly after prayer. Amen. Below, is a review that I was very surprised to receive, from a woman who attended a meeting at Glory Fire Church, Sanford, FL, US. As I prayed for people along the alter call, I had no idea about the history or extent of the damage that this lady had gone through at all, just that it was back pain. 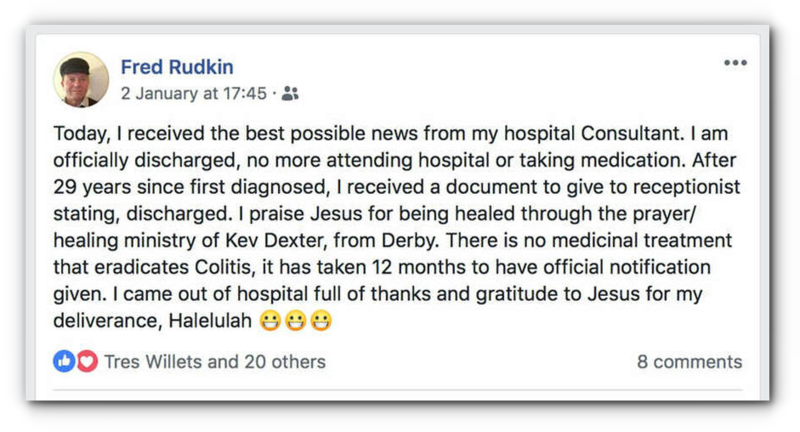 This lady, had a blood clot in her ankle and the doctors had her on tablets for nearly half a year.. and this is what happened when we prayed for her tonight..
​I’ve just received this healing testimony from the pastor at Speakers of Life Durham, from the meeting on 17th November. A testimony where God healed Him from Colitis, an illness the doctors say is incurable and an illness, which he’d had for 28 years!!! Praise God. Back in October 2016 Kevin Dexter, came to Speakers of Life Conference with a woman Speaker from America. He did pray then for the Colitis problem I had. 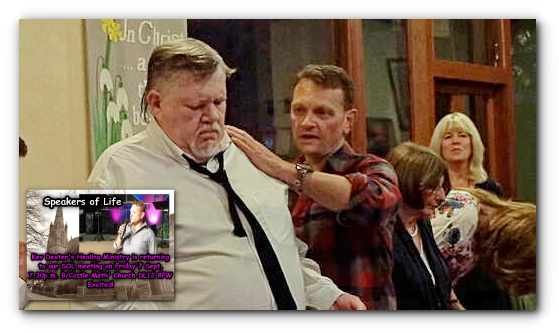 Then, after Kevin Dexter had been invited to minister at Durham SOL on 17th November 2017, he specifically laid hands on me again, to be healed completely prior to my consultation visit at Darlington Hospital in December. This time of ministry with Kevin Dexter gave me the confidence to say to Consultant that through prayer. I believed I was healed, and to say that the next endoscopy would see a clean bowel. He took me by surprise when he said I could have it before or after Christmas, I felt it right to go for the early test. Then when the doctor who performed the endoscopy spoke to me beforehand, she asked would I take the tablets if the test revealed Colitis. I replied no I would be alright. After it was done, the doctor just said it looks better this time. 19 January 2018, I had to visit my GP (General Practitioner) with an unrelated issue, and it was then she read out the Consultants’ report, “6 biopsies taken, no signs of Critical Colitis, and no malignancies” my doctor confirmed I would not need any more visits to hospital and took the medication off my prescription. I thanked and praise Father God of our Lord Jesus Christ, for using the healing ministry of Kevin Dexter to bring about a total healing and a miracle. Colitis is one of those inflammations of the bowel that cannot be healed but medication only controls symptoms and usually you are on the medication for life. So Jesus just gave me a wonderful miracle of healing and new life by the ministry of laying of hands. I am blessed and thankful for Kevin Dexter’s Healing Ministry. P.S. My GP thanked me for sharing my story, I am sure she does not get many like this. Fred Rudkin from Barnard Castle, U.K.
God heals deafness and a hernia at Cornerstone Glory International Church, Petaling Jaya, Selangor during the meeting, praise God. Testimony from a young lady that I prayed for at the Glory Well in Arundel, Queensland, Australia. This guy shared what happened to him after prayer for his cancer, during the meeting in FGB Subang Jaya USJ 1/1B. Looking forward to hearing his progress. Praise God. Although this lady had received much prayer before, much of her deliverance in this ministry session, was accomplished through breaking freemasonry curses, and casting out the unclean spirits that were related to it. Below she testifies to the healings that she received through the deliverance, praise God. This young lady had a cyst on the brain, that was causing her much pain and causing her to miss much of her schooling. God removed it tonight, how awesome. ​Some time ago, while speaking at a gospel outreach in India, I witnessed God do some amazing miracles, and at the end of one of the evenings a lady came and asked me if I would go back to her house and pray for her son. So I went to her house and as she opened the door to this darkly lit room. There was a mattress lying in the middle of the room and, lying there, was a man, probably in his thirties. He was mute, and probably the most double-jointed, deformed person I’d ever seen in my life. The woman said with a smile on her face, "This is my son. Please can you help him” and even though I’d witnessed lots of healings that night, this situation was just heart breaking. So as I kneeled down beside him and prayed against any generational curses on his family line and against any dumb spirits, amongst many other things, and although I’d witnessed many miracles earlier that evening, I never witnessed anything happen to this man, in any way whatsoever. I was so overwhelmed with emotions that I was praying and praying without listening, then as I realized I stayed quiet trying to focus, but I didn’t seem to receive anything, I did feel the presence of the Holy Spirit over him, and so I just believed that God was doing something! The next night during the outreach, the lady came rushing up to me, flung her arms around me with tears running down her face, and said that her son used to have fits every half an hour, but since that morning all of his fits had stopped and he’d started to speak for the first time in his whole life. She said that he was talking like a baby. Wow! Amen. So even though you don’t fully understand the “whys” or see the manifested evidence of what you are praying for, never stop believing by faith. Video footage taken from an Agape Fellowship meeting in SW France, where a guy gets a touch from God for his skin disorder - vitiligo. MUTE AND AUTISTIC BOY SAYS “JESUS”, FOR THE FIRST TIME! Such an honour and a privilege to be used and witness the Father heart of God touch children in this way. Another testimony received from the recent S.O.L meeting at Barnard Castle – Halleluiah! A friend, Alan Atkinson 70, whom I had led to the Lord recently, asked Kevin to pray for cramps in his body. He has never been to any healing and deliverance meetings before. His cramps were so bad that he could not sleep properly at night for a long time; in fact he struggled to sit still with them throughout the meeting! Alan said after Kevin Dexter had prayed for him, he has slept like a baby and had no cramps. He is very pleased about it and has had many nights of good sleep. No cramps so far! Amen. Thank you Kevin for praying for him and Praise God for his healing. Fred Rudkin. In fact, I received a message from Alan, (a month after the meeting), to tell me that not only is he still 100% healed from his painful cramps, but when he went to his doctors to get checked, he was also given the “all clear” from his diabetic nurse too! 7 years he’d had blood sugar and pressure problems! God is full of surprises, how awesome! Whilst ministering at a prophetic bible college in Scotland, I felt an angel touching my left ankle and I just knew that there was someone in the room with pain in their left ankle, I looked around the room, thinking that the Holy Spirit would lead me to the person, I actually felt this pain for about 10 minutes while pondering who it was, when suddenly the door opened and a guy i'd never met before, turned up late to the meeting, hobbling into the room wearing a metal brace from his foot to his knee on his left leg! And as the meeting finished, this guy came straight over to me and asked for prayer. The guy had in fact got a brain tumour which was stopping him using his ankle, so I asked a lady to pray with me and as we prayed, the guy said that he could feel the tumour shrinking inside his head! Amen, and the lady received a picture from the Lord to confirm, so then we prayed over his ankle and eventually he took of his metal splint and began to walk around the room! He actually walked out of the meeting carrying his splint over his shoulder lol.. Our God is amazing!